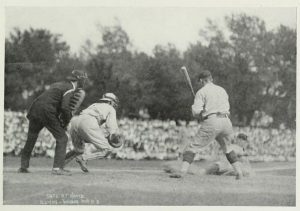 For over twenty years, from 1911 through 1931, Japanese university baseball teams came to schools like Illinois (and our peers across the U.S.) for friendly competitions and international community building through baseball. Over the course of two decades, many Japanese athletes, coaches, educators, writers, and future baseball legends would include Illinois in their successive U.S tours in the name of goodwill between cultures through athletic competitions. Read on to learn more about early Japanese and Illinois Baseball! On this day, June 1, the first Japanese and Illinois baseball game was hosted on campus at the former Illinois Field. The story starts with an initiative by Japanese educators at multiple Japanese schools of higher education. As early as the summer of 1904, as reported in the Daily Illini (Record Series 41/8/81), Japan’s Waseda University had begun arranging international baseball competitions between their team and U.S. schools. Initially, Japanese educators contacted west coast schools like Stanford University, who played two home games during the summer of 1905 and played an away game in Tokyo in 1907. However, after an initial contact with the University of Chicago in 1907, the Waseda team had begun regular Midwest trips shortly thereafter. By winter 1910, following Minnesota, Illinois would be the next school to host the Waseda team during the expanding U.S. tours. In January 1911, talks to secure the Keio University team had begun too, with two games proposed; but, unfortunately, Keio had to postpone–but they would come at a later date and invite Illinois to come to them too. 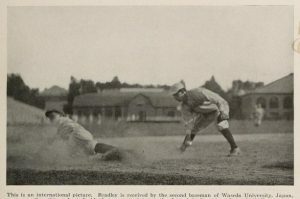 As the 1911 Waseda tour progressed and in anticipation of the campus game, the Waseda team’s performance was reported regularly in The Illini (now Daily Illini). We know that Stanford won the April 1911 game, for example. 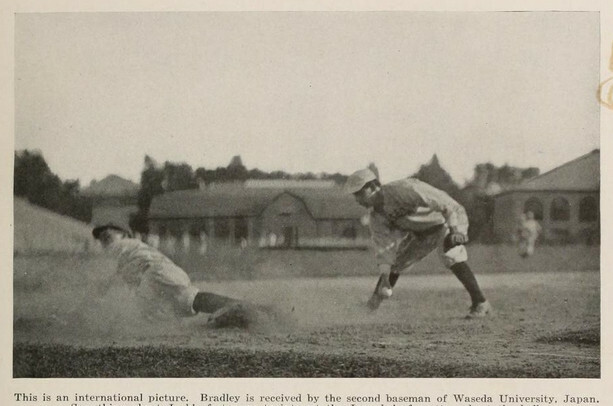 Published around the same time, from a Collier’s interview with Chicago’s 1910 team captain, we can read descriptions of the Waseda team as both competitive and fair, as well as tougher to beat each year. While in Japan, the Chicago team was impressed by how courteous and supportive the Japanese fans were to both teams. Waseda had arranged for games throughout May, with Illinois as one of the final stops. Of course, every U.S. school organized welcome receptions too. Wisconsin organized a weekend carnival. In Chicago, the celebration included the Illinois Governor, the First Lady of Illinois, the Chicago mayor and his wife, as well as the acting Japanese Consul H.S. Shimizu. In fact, while at the Iowa game, The Illini reported, there were two addresses at the festivities organized by the Japanese students of Iowa. The following day, The Illini reprinted Waseda Team Captain Sutekichi Matsuda’s friendly open letter to U.S. competitors originally found in Chicago’s student newspaper the Chicago Maroon. A 1913 Illio group photo of the 1911 Illinois Baseball Team found in Record Series 41/8/805. In anticipation of Waseda’s arrival and game at Illinois Field, the DI produced and reprinted a series of articles describing the Waseda team’s performance (May 27, May 30, May 31, Advertisement). Their travel schedule was tight too. 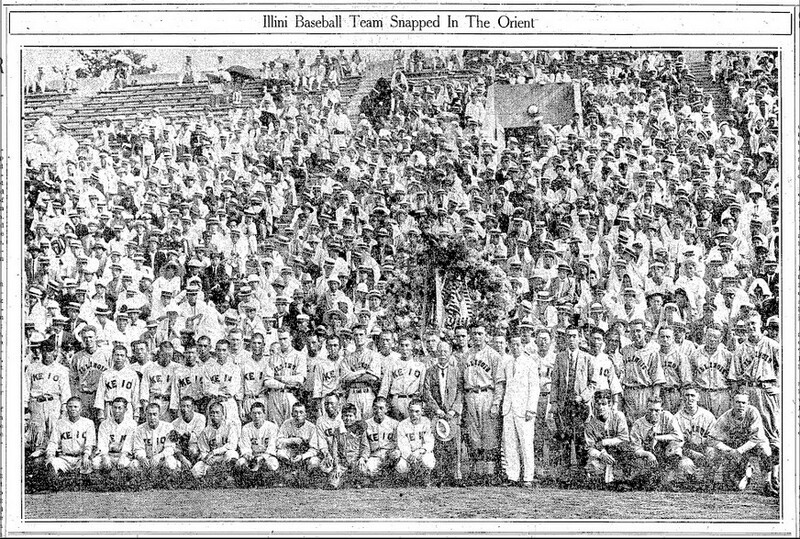 Consider that for the 1911 game, the Waseda Team arrived on Thursday morning and they had to leave on Friday morning to travel to their next game. While Waseda was in town, however, there was just enough time for the game and an evening reception–organized by local Japanese Illini at the Cosmopolitan Club House. Meanwhile, at least one Illini even wrote a public letter appealing to all Illini to be the best hosts possible to the Japanese guests. In the end, Illinois won the game with good batting, while the Waseda team was acknowledged for their pitcher’s nine strike-outs and one Waseda batter’s surprise home run, the Urbana Courier reported. The game and goodwill must have been a success, given that the Waseda team would return. 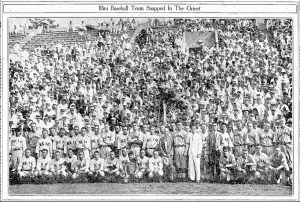 Five years later, it was 1916, when the Waseda team returned to Urbana-Champaign for Illinois’s last home game. Illinois won again; but, some would say that Waseda’s fielding was recognized as seen in one such post-game write-up in the DI. And again, fortunately, Waseda would return again in five years with an even stronger team still. Also fortunately, at least one photo of the game can be found in the Illio (Record Series 41/8/805). A 1918 Illio photo of the 1915 Illinois-Waseda Baseball game found in Record Series 41/8/805. The team returned in 1921, with Dean of the School of Political Economy, Director of University Libraries, and Athletic Association Head, Mr. Abe Isso and Professor H. B. Benninghoff. Like its predecessors, the May 21 game was anticipated in during May, as Waseda defeated many teams. After an initial rough game with Chicago, Waseda beat Northwestern, then they beat Butler, then they beat Indiana too, before returning to beat Chicago. Meanwhile, like in 1911, student writers again encouraged good sportsmanship and hosting from the fans. The night before the game, at the Beardsley Hotel, Japanese Illini organized a welcome banquet for the team, featuring a talk by Athletic Director George Huff (Record Series 16/1/21). After the banquet, at Morrow Hall, Mr. Isoo gave a campus talk “Militarism in Japan“, and Mr. Benninghoff gave a cross-cultural communication talk titled “Thinking Yellow”. Multiple Daily Illini writers would report on these talks. In an interview with The Daily Illini, Mr. Isso explained Waseda’s appreciation for the U.S., his hope for international peace building with athletics, and he invited the Illinois team to play in Japan for the following summer. It was a close game, with an Illinois win of 1-0. Perhaps equally exciting, it was on Saturday afternoon, at the College of Commerce (now Gies College of Business) luncheon, when Mr. Isso invited any interested Illinois graduates to come work in Japan. A 1923 Illio photo of the 1921 Illinois-Waseda Baseball game found in Record Series 41/8/805. As early as 1924, plans were made to bring the traveling Meiji University baseball team to Illinois. Ultimately, the Meiji game was set for Thursday, May 24, following games at Nebraska and Iowa. 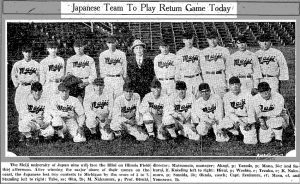 Japanese teams, like the Meiji team, were getting better every year, as one The Daily Illini writer explained. Upon the Meiji team’s arrival, the local Japanese Illini organized a welcome reception for the team, at the Cosmopolitan Club House, featuring songs in Japanese and English. It was a close game, with Illinois winning and breaking a recent loosing streak too, and at least one tense moment of an attempted stolen third base. A 1926 Illio photo of the 1924 Meiji Baseball Team found in Record Series 41/8/805. In December 1927, a twenty-seven member Keio University baseball team arranged to compete in at least twenty-five games across the U.S., shortly after arriving in San Francisco on April 13, it was reported. In January, it was confirmed that Illinois would host two games scheduled for May 8 and 9. Before reaching Illinois, the DI reported that the Keio team had won five of eight games, suggesting that this team would be every bit as competitive as their peers. The Keio team was scheduled to arrive after noon on Tuesday, drop-off their belongings at the Inman Hotel, and be on the field before 3:00 pm. Meanwhile, the Illinois freshmen team was tasked with warming-up the Varsity team. 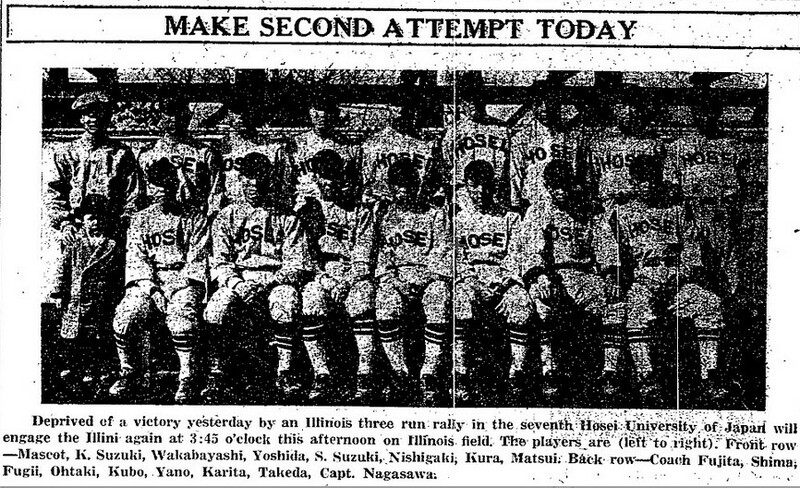 The Tuesday game was a big win for Illinois; although, at least one DI writer reported that the Keio team’s batting and fielding was still good. The Wednesday game was much closer; but, it was another win for Illinois. After the game, in a DI interview, Keio coach, Mr. Koshimoto, congratulated the Illinois team for its great pitching. In fact, one team member, the team manager Mr. Fukuichi Fukumoto, even made special arrangements to stay at Illinois for an additional six weeks to study Baseball coaching under Illinois coach Carl Lundgren. For the U.S. tour, Mr. Fukumoto was the team’s manager. After completing the University Coaching School, Mr. Fukumoto returned to Japan where he became a Sports Editor for the Osaka Mainichi Shimbun newspaper, the DI reported. 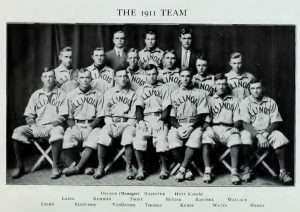 Within weeks of the last visit by the Keio team, at the Keio team’s invitation, there were already University talks concerning sending an Illinois baseball team to Japan. Although ambitious initial plans included games in Hawaii and China, the final tentative plans included about ten games in both Osaka and Tokyo, Japan, including games against Waseda, Meiji, Keio, and another yet to be selected school. From August 11 through 27, with a half-day stop at Honolulu, the team would voyage from San Francisco to Yokohama. From September 20 through 29, the team would voyage back, before taking trains back to campus, with an estimated arrival of October 1, the DI reported. In mid June, fifteen members of the 1928 Illinois team were selected to go on the trip to Japan. Meanwhile, the DI ran a story about the University of Southern California team who toured Japan at the beginning of the summer. By late July, the tour was extended to include 13 games with amateur teams at U.S. towns along the train route from St. Paul to Seattle to San Francisco. (Illinois won ten games, tied two games, and lost one). News of the Illinois team in Japan were carried through the Associated Press. By September 11, it was reported, the Illinois team had three wins, two loses, and one tie. The next few press reports were brief, because cable rates were expensive to transmit long messages (September 14, September 18). By September 20, a long account and two additional newspaper clippings were provided via a letter from student manager H. A. Boling. Citing a lack of space to practice batting and a long voyage across the calm but great Pacific Ocean, Mr. Boling’s letter describes the first two Illinois games as below expectations. In another surprising moment, Illinois’ international connections had preceded the team, evidenced in that upon arrival in Japan, the Illini Club of Tokyo was ready and waiting to receiving the students–with Keio University members too. The following day, on a Saturday night, the Keio team took Illinois team to dinner on the rooftop garden of the historic Tokyo Kaikan building, to try the beef dish Sukiyaki. On Monday night, the Tokyo Illinois Club took the team to the Seiyoken rooftop restaurant in Ueno Park. Of the eleven games, the Illinois team played against Keio six times, Waseda two times, Meiji two times, and Daimai one time, in stadiums holding from 15,000 to 35,000 attendees. During the trip, there was some time for shopping and sightseeing, as described in one DI report. And on at least one occasion, the Illinois team sang “Hail to the Orange” as part of a Keio University assembly to meet the team. As a trip souvenir, two baseballs were signed: one Japanese Kajimaya ball was signed by the Keio team; one Spaulding ball was signed by the Illinois team. The following school year, Keio also sent a memorial silver cup for Illinois’s 1928 tour. A great variety of photos and a two-page account of the tour can be found in the 1930 Illio. A 1928 Daily Illini photo of the 1928 Keio and Illinois Baseball Teams found in Record Series 41/8/801. 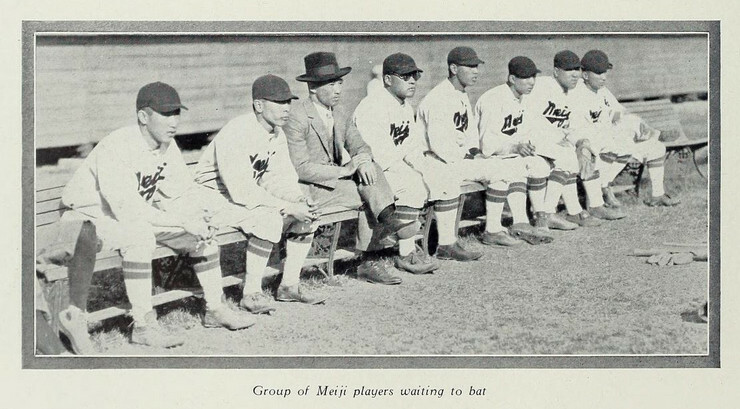 The following year, in 1929, the Meiji team would return to Illinois for another highly anticipated game. At least one DI editorial described the enthusiastic Illini spirit to return the hosting favor for their Japanese peers. After playing Michigan, Illinois would be the next stop before games in Indiana, Iowa, then Ohio. 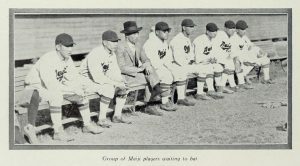 In fact, Coach Lundgren helped coordinate the Meiji team’s Midwest schedule for the summer of 1929, the DI reported. The Meiji team arrived on Wednesday evening, May 8, and their Thursday was busy. After the afternoon game with Illinois, the Athletic Association hosted a banquet for both teams at the Champaign Country Club, with program booklets printed in the Meiji team colors purple and orange. The DI expected high attendance for the game, and one staff writer documented the team’s initial arrival in Champaign. Illinois won the game, and local writers praised the Meiji team for their skill. Even the DI editors praised Illinois fans for showing exceptionally fine sportsmanship too. 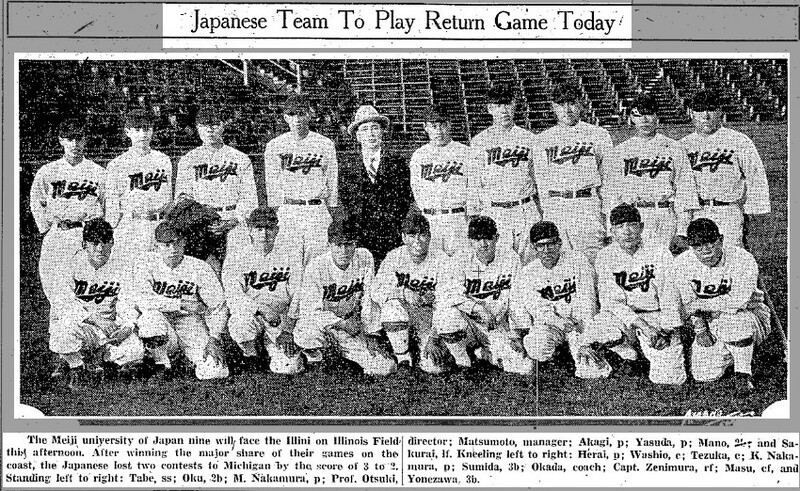 A 1929 Daily Illini photo of the 1929 Meiji Baseball Team found in Record Series 41/8/801. Two years later, the Hosei University Baseball Team came to town for two games in May for a highly anticipated game. The Hosei Midwest tour started rough with a loss to Michigan, but they beat Notre Dame. Locally, some Illini fans were concerned. Recent rain had prevented most local drills before the game, and the reserve team’s away game at Lake Forest was rained-out. Meanwhile, the Athletic Association arranged an informal reception for the Hosei Team in the Southern Tea room, and of course a DI writer was at the banquet to report. Both games were close with narrow Illinois wins. The first game featured, “excellent fielding, strong hitting in the pinches, and fast baserunning” by the Hosei team, one DI writer reported. The second game featured multiple errors by Illinois but an important run in the ninth inning to close a win for Illinois, it was reported. A third important Hosei-Illinois exchange came in 1932, when a Mr. Fujita of Hosei published a Japanese translation of Carl Lundgren’s coaching book Baseball: Individual and Team Play in Outline Form. 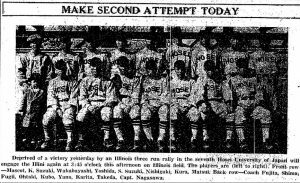 A 1931 Daily Illini photo of the 1931 Hosei Baseball Team found in Record Series 41/8/801. Were there any missed games or details from story above? 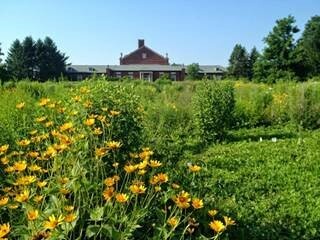 Do you know someone who was involved in early Illinois and Japanese baseball? We’d like to hear from you! Please send us a message or leave a comment below. We want to include you and your story, as we celebrate the first 150 years of the University of Illinois. This entry was posted in Research, Students, University Trivia and tagged Illini Everywhere, international students, student history, student publications. Bookmark the permalink. Trackbacks are closed, but you can post a comment.